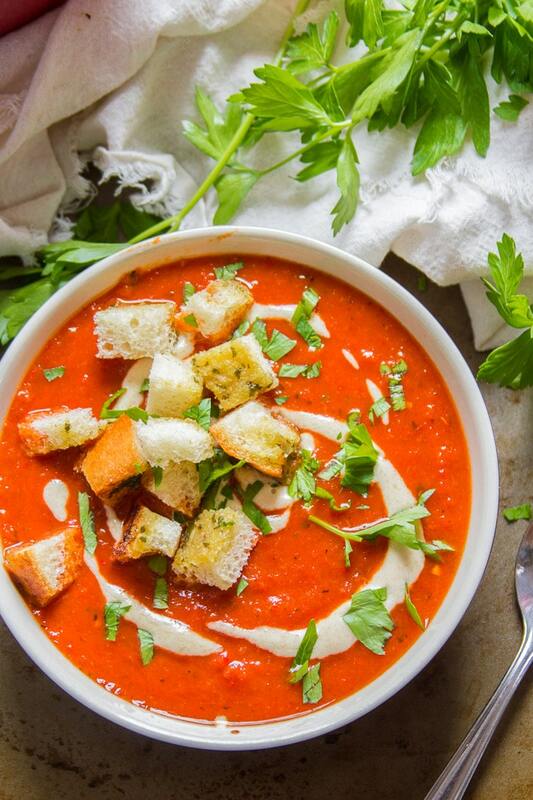 This silky and flavor-packed roasted red pepper soup is made with juicy roasted bell peppers and smoky fire roasted tomatoes. Absolutely scrumptious when topped with a dollop of tahini sauce and homemade garlic bread croutons! Here’s something you might not know about me: I have an amazing ability to trash a kitchen. I know, pretty special right? Seriously though, I’ve been keenly aware of this lately, as the amount of daylight is quickly dwindling, and the time for photographing food is during the daylight hours, when I should be getting other work done. Right. This results in me rushing way more than I need to and transforming into a hurricane that spews dirty dishes and vegetable scraps everywhere in my path. I usually don’t have time to clean up right then and there, so I abandon my disaster for later on, forget it exists, until I’m reminded upon reentry into the kitchen at dinnertime. Sigh. I console myself with the fact that messy food is the best food. This is a fact. Well, this soup made a big mess, so I wasn’t sure if I should warn you or try to explain myself. I’m not exactly sure what I decided on, but you can read into the above and decide for yourself. I’m actually surprised it made such a huge mess, because it was really easy. Usually the simple stuff doesn’t do that, which leads me to believe the mess was a result of my rushing and no fault of the soup. It was also really delicious. The tahini and croutons are just dreamy. I mean, the soup itself is great and all. 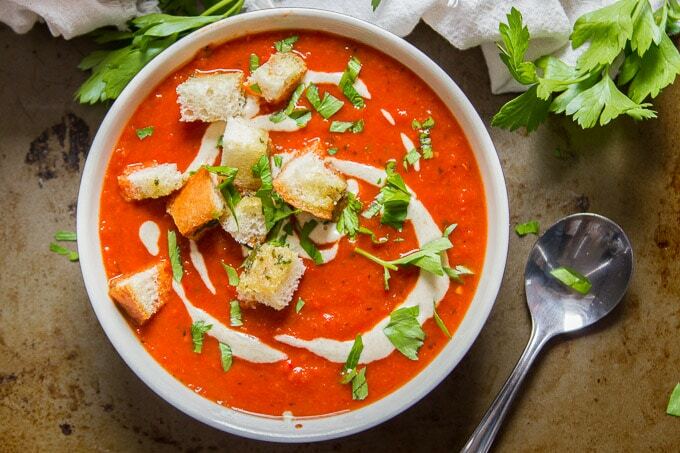 Simple red pepper soup, which I’ve made a million times before, and which I love but apparently I love it way more with tahini and croutons, because this was heaven. Don’t skip the tahini and croutons! You don’t have to swirl the tahini sauce, as long as it’s in there. Start by roasting up some red peppers and onions. And while you’re at it, roast up some garlic too. I like to reserve a single garlic clove when I do this, and then I add it to the soup for a little bite. That’s up to you though! Roast the peppers until the skins start to blister. This will make it easier to remove the skins. I’m going to be totally honest here (so much of that in this post! ): I usually get lazy and leave the tough bits of skin on the peppers. That’s maybe 15% of the skin. Once you blend everything up you’ll never know it’s there. All your roasted goodies go into a pot along with some fire roasted tomatoes. I know, this is red pepper soup, right? So why the tomatoes? 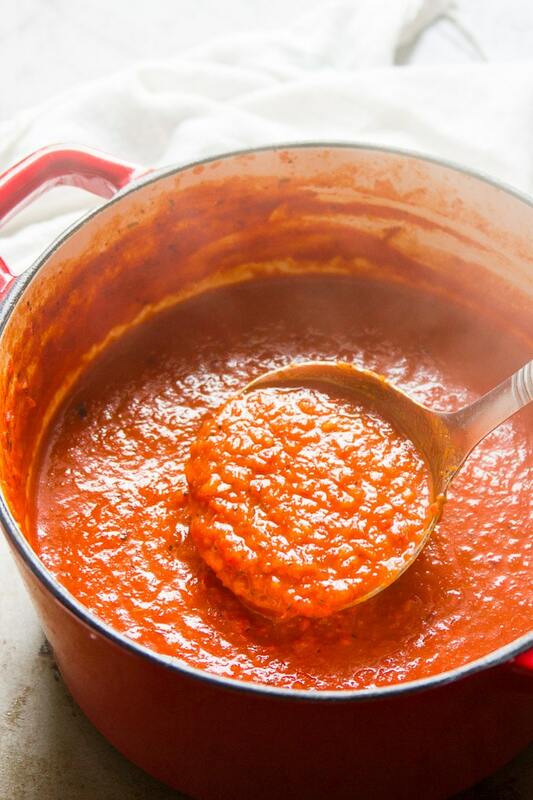 I’ve come to the realization that a little bit of tomato supplies some crucial acidity to red pepper soup. So use ’em! It’ll be better that way! Blend everything up. I acquired an immersion blender during the past year, and it’s now one of my favorite kitchen tools. A food processor or blender will work too though. Transfer everything to a pot, add some broth and seasonings and give it a brief simmer. That’s it! Serve with a dollop of tahini sauce and some garlic bread croutons. Hopefully you didn’t trash the kitchen. Either way, enjoy! 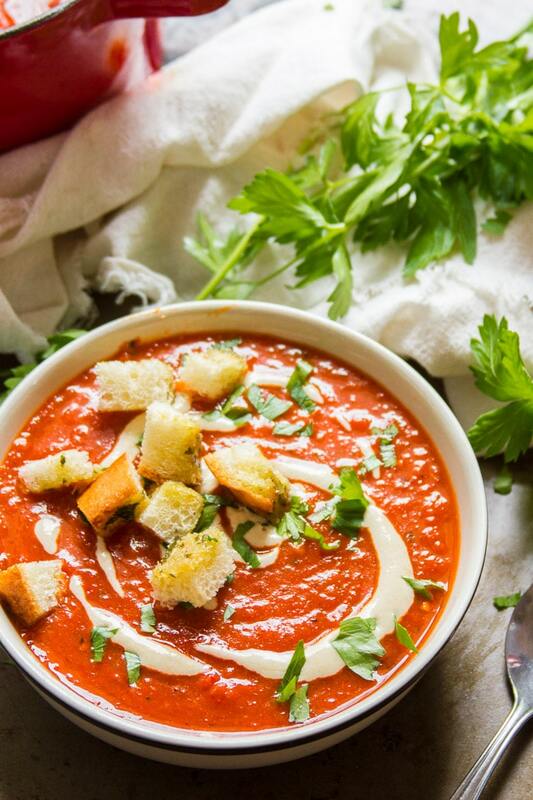 To make this recipe gluten-free, either skip the croutons or use gluten-free bread to make them. This soup keeps well in the refrigerator for a couple of days, and is super freezer-friendly. The croutons are best served immediately, but they’re still totally fine a day after you make them. Not into tahini? 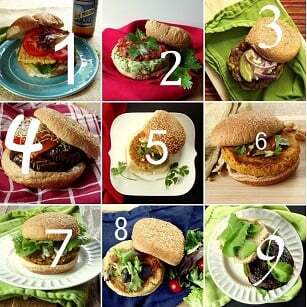 Cashew cream or store-bought vegan sour cream make great alternatives! 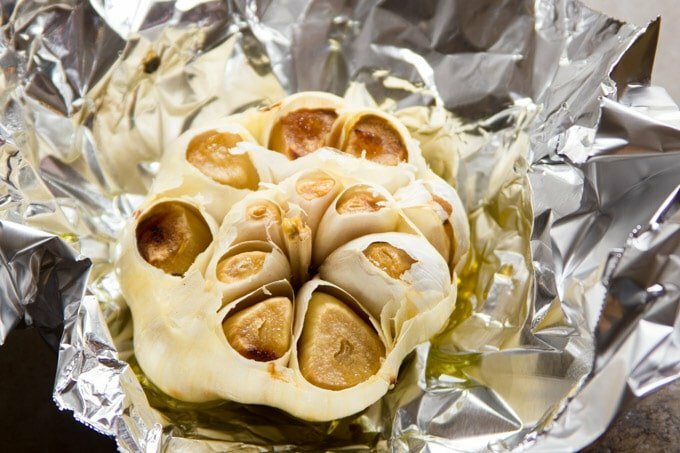 This recipe asks you to wrap your garlic in foil when you roast it. If you’re trying to avoid cooking with foil, try a garlic roaster. For an extra creamy roasted red pepper soup, try swapping out about a cup of vegetable broth with coconut milk. Place the peppers and onion into a roasting pan or oven safe skillet and drizzle them with 1 tablespoon of olive oil. Toss to coat. Cut the top off of garlic bulb, exposing the tops of the cloves. Remove one clove, mince it, and reserve it for later. Set the garlic bulb on a sheet of foil and drizzle it with 1 tablespoon of olive oil. Loosely wrap it in foil. Place the onions, peppers and garlic into the oven. Bake the onions and peppers until browned in spots and some blisters appear on the peppers, 30-35 minutes, flipping once or twice during baking. Bake the garlic until cloves are light golden brown, about 35-40 minutes. Remove it from oven, open up the foil and allow it to cool. When the garlic is cool enough to handle, squeeze the bulb to extract the roasted cloves from their skins. Blend the veggies. 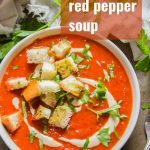 Transfer the peppers, onions, tomatoes, roasted garlic and raw garlic to a food processor or blender, or place them in a large pot and blend with an immersion blender. You can add some broth to help this along if needed. If you used a food processor or blender, transfer the mixture to a large pot now. Stir in the broth, vinegar, paprika and thyme, and place the pot over medium heat. Bring the mixture to a simmer, lower heat and allow to simmer for about 10 minutes, until it thickens up a bit. 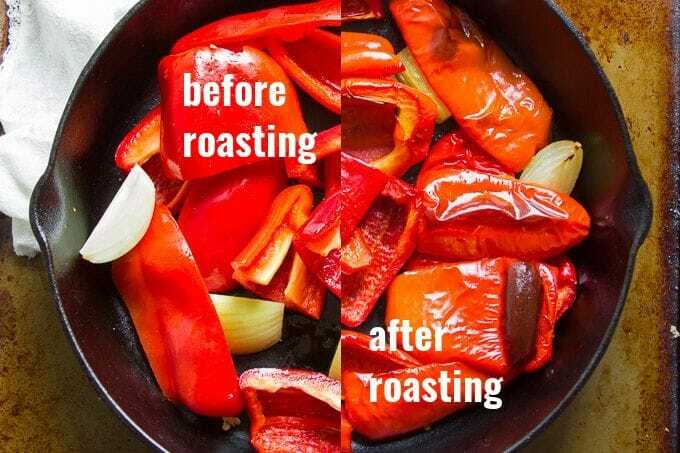 Remove the pot from heat and season with salt and pepper to taste. While the soup simmers, stir the olive oil and garlic together in a medium bowl. Arrange the bread cubes in an even layer on a baking sheet. Sprinkle them with salt and pepper. Place the baking sheet under a broiler and broil just until browned, about 5 minutes, watching carefully to avoid burning. Ladle the soup into bowls and top with tahini, croutons, basil and/or parsley. You can also stick your croutons into the oven with your veggies and allow them to cook for fifteen minutes or so, flipping at least once. You'll end up with something a bit more croutony and less garlic bready. Wow, roasted red pepper! Sounds delicious! Made this for dinner – so good! Added chopped basil since it was the only fresh greenery on hand, and it worked splendidly. Thank you! Awesome! I love the idea of adding fresh basil. I just garnished with some parsley I had hanging around, but next time I’ll make sure to get my hadns on some basil. Glad you liked it! Thanks for sharing! I think I do have to swirl the tahini sauce…. it looks so pretty!!! Yay!! I’m so glad to hear that! Thanks Pam!